When you call to make an appointment, not only will I see you the same day, but you will never have to wait more than 15 minutes before I personally examine you. At Advanced Spine & Injury, our goal is to find and remove the causes of your pain so you can live each day with good health and vibrant energy. With nearly 30 years of clinical experience and the latest science and healing technology, "wellness" is more than just a word to us. It's a way of life for our patients and our staff. We believe in it. We practice it every day. And we're living healthier lives because of it. 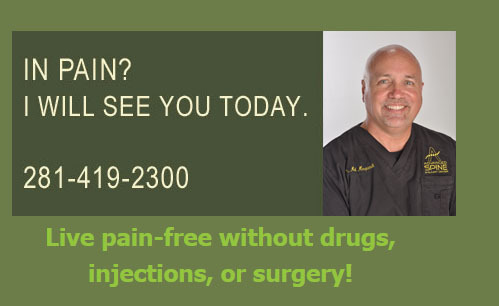 We invite you to discover what living pain-free can do for you! We are your North Houston Chiropractor, conveniently located at I-45 and Rayford/Sawdust in Spring / The Woodlands, Texas. Take a look around our site to learn more about how we can help you! If this is your first experience with us, visit our New Patient Center and learn more about our office in the About Us section. Read how people just like you experienced relief from their pain in our collection of Success Stories. You can also read more about our exciting advanced therapies like Spinal Decompression and Cold Laser. For more information about chiropractic therapy and the health conditions we can treat, view our Wellness Topics. Sign up for our free newsletter and become a member of our site for even broader access to our huge members-only section of wellness topics. We invite you to contact us with any questions and to set up a time for your complimentary examination. Don't suffer with pain any longer! "My home away from home! My whole family sees Dr Mark (yes even the 5 year old) you are always made to feel welcome and I'm still finding Dr Mark fixing more ailments than the family doctor."